Because Sun understands your online needs, here’s the Sun Postpaid Plan 450 FREE MyPhone A919 Phablet, a phablet offer you definitely shouldn’t miss. 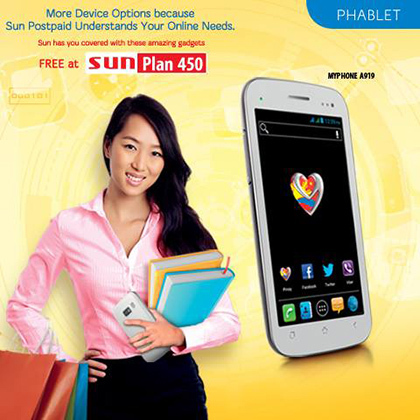 Get 20 hours of mobile internet when you avail of the MyPhone A919 phablet, FREE on Sun Postpaid Plan 450. Here’s the complete list of Sun postpaid application requirements, HERE. Visit Sun Cellular Facebook for more details and latest updates. Ask poh kung magkano cash out ng phablet?